KLS is working in collaboration with an Environmental Consulting firm to deliver innovative site remediation and restoration solutions to a Developers site in Southern Alberta. The owner was faced with the challenge of over 10,000m3 of soil impacted with concrete and rebar debris that was dumped on 2 sides of a gully over 30 years ago. The owner was committed to restoring this site to its natural state, but was faced with the scenario of substantial excavation, disposal, and import backfill costs associated with utilizing common remediation techniques. The owner was impressed with the solution offered by KLS that not only restored the site, but also included a significant repurposing of soil and recycled materials – both on-site and at a different off-site location. 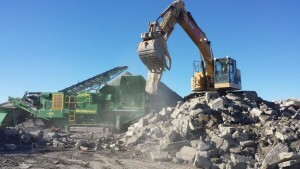 The utilization of soil/debris screening techniques and on-site material processing, resulted in KLS being able to segregate and recover a significant portion of the soil to allow it to be returned to its native environment. By doing so, the carbon footprint impact from this project is significantly reduced as trucking required for off-site disposal and import soil transport are virtually eliminated. Not only did this solution provide significant cost savings, but it also demonstrates how a remediation project can provide recycling options and benefit future projects and locations.